Emotional Intelligence (EI), also known as Emotional Quotient (EQ), is the ability to manage one’s emotionsNetworking and Building Relationships (Part 2)This article is part of a series of useful tips to help you find success in your career and the totality of your life experience. While technical skills get us hired for our preferred post, soft skills help us communicate and collaborate effectively in the workplace. Soft skills such as knowing how to get along with other people and the emotions of others. The term emotional intelligence first appeared in a 1964 paper by Michael Beldoch and gained popularity in 1995 in a book written by science journalist Daniel Goleman. Today, emotional intelligence is widely talked about in the scientific and business communities and compared rigorously to intelligence quotient (IQ). EQ is extremely important for business leadersLeadership TraitsLeadership traits refer to personal qualities that define effective leaders. Leadership refers to the ability of an individual or an organization to guide individuals, teams, or organizations towards the fulfillment of overall goals and objectives. This list of leadership traits will explain each one, as this guide will argue. In Goleman’s book, titled “Emotional Intelligence – Why It Can Matter More Than IQ,” published in 1995, a framework comprised of five elements is used to characterize EI. The degree to which an individual can understand their own, and others, emotions is a main component of emotional intelligence. Self-awarenessNetworking and Building Relationships (Part 3)This article is part of a series of useful tips to help you find success in networking and building relationships within your company. If we want to move forward in our career, building relationships is the first step towards the journey to success. involves the ability to recognize an emotion and their effects. The degree to which an individual can control their emotions and impulses. People who self-regulate can avoid allowing their negative emotions to lead to a long-term negative effect, i.e., not making impulsive, careless decisions and thinking before they act. The degree to which an individual is able to motivate themselves and achieve their goals. Those who are motivated are achievement-driven, committed, optimistic, and take the initiative. The degree to which an individual is able to identify with and understand the viewpoints and needs of others. An empathetic person often has a high level of emotional intelligence and is able to recognize feelings of those around him/her even when those feelings may not be readily apparent. The degree to which an individual is able to communicate with others and build and maintain relationships. The more an individual is able to manage each of these areas, the higher their emotional intelligence is. For business leadersLeadership TraitsLeadership traits refer to personal qualities that define effective leaders. Leadership refers to the ability of an individual or an organization to guide individuals, teams, or organizations towards the fulfillment of overall goals and objectives. This list of leadership traits will explain each one, possessing a high EQ is essential to success. Let us revisit the five elements of a person’s emotional intelligence quotient (EQ) and their importance to characterizing a successful leader. Being self-aware means getting a clear picture of your own strengths and weaknesses. Leaders understand their own capabilities and are able to leverage their strengths while at the same time improving on their weaknesses. Leaders are able to regulate themselves effectively and control their emotions and impulses. For example, leaders do not make rash emotional decisions, verbally attack others, or compromise their own values. Leaders hold themselves accountable, are calm, and understand their values. Leaders are motivated and formulate a goal that they consistently work toward. They hold themselves to a high standard and take the initiative when needed. Possessing empathy is crucial to team or organizational managementCorporate StructureCorporate structure refers to the organization of different departments or business units within a company. Depending on a company’s goals and the industry which it operates in, corporate structure can differ significantly between companies. Each of the departments usually performs a specialized function. Leaders take the time to develop and understand the people on their team. They recognize the body language and feelings of others and are able to act accordingly in any situation. Leaders communicate effectively and are good at identifying and resolving conflicts. Leaders inspire others by leading by example and giving praise to others when earned. From the list above, you can see that the elements are highly similar to important leadership traitsLeadership TraitsLeadership traits refer to personal qualities that define effective leaders. Leadership refers to the ability of an individual or an organization to guide individuals, teams, or organizations towards the fulfillment of overall goals and objectives. This list of leadership traits will explain each one. Leaders must gain a sound understanding of their emotions and the impact of their actions on the people around them. 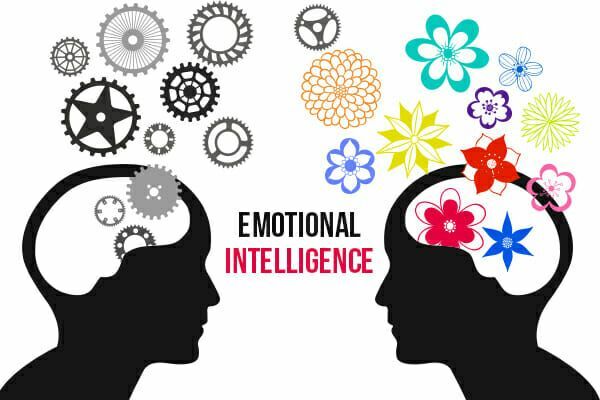 Emotional intelligence quotient (EQ) and intelligence quotient (IQ) are often contrasted with each other – which is more important? There are arguments for and against each side, but the general consensus is that both are important. Originally, IQ was viewed as the main determinant of success. However, critics pointed out in the past that IQ did not guarantee success in life. Therefore, the concept of emotional quotient was introduced alongside IQ as determinants of success. In fact, in the business world, many companies put in place mandatory emotional intelligence training and utilize emotional intelligence tests in the hiring process. Emotional intelligence is an important quality for business leaders and managers. Term Ability to manage, identify, assess, and control one’s emotions and the emotions of others Ability to understand and apply information to logical reasoning, skills, spatial thinking, etc. Success results from many factors. It is important to not undermine IQ and EI as they both play an important role in influencing overall success. Thank you for reading CFI’s guide to better understanding EQ and IQ. Below are additional resources from CFI, the global provider of the Financial Modeling & Valuation Analyst (FMVA) designation.